This is the Lyonshel® Rat Face. This prosthetic mask was made to fit most faces. Like other Lyonshel® masks, this piece is only available in hot foam latex. Visit our FAQ for information about hot foam latex. 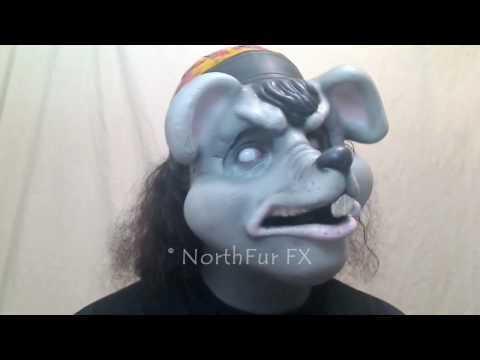 This Lyonshel® Rat Face is a full face mask that'll cover your brow, nose, cheeks and chin to create an evil or sneaky looking rat. It is a massive piece! It has a medium-sized narrow muzzle, ears, big cheeks and a tuft of hair. It also comes with a set of rat teeth. It can be painted many different ways for various rat and mouse colors. . It is one piece and comes unpainted by default. Contact lenses and other prosthetic pieces other than the Lyonshel® Rat Face that are shown are not included. Using these types of costume accessories can help accentuate this prosthetic piece's rodent features.